Streptocarpus beampingaratrensis is a member of the Streptocarpella subgenus, in the Parasaintpaulia Section. While its form looks very much like a Saintpaulia it is not particularly closely related, suggesting parallel evolution in plant structure and foliage type. Note, though, the twisted seed pods and Streptocarpus-like flowers. The DNA studies of Michael Möller, Quentin Cronk, Charlotte Lindqvist, Victor Albert have been critical in deciphering the evolutionary history of African violets. Möller and Cronk focused on ribosomal DNA sequences and Lindqvist and Albert on chloroplast DNA. Nuclear DNA is inherited from both seed and pollen parent while chloroplast DNA is inherited only through the seed parent. The results of the DNA studies disputed Burtt’s hypothesis that the Usambara Mountains was the ancestral home to African violets and the species had spread to other localities from that location. Burtt’s reason was that the Usambara Mountains had the most “species” and therefore was most likely to be the ancestral home and center for distribution. DNA studies revealed that the most ancestral African violet was actually Streptocarpus goetzeanus the high elevation, cold–loving species from the Uluguru Mountains. African violets had apparently spread north into other areas. However, the Usambara Mountains are the largest of the Eastern Arc Mountains. Once having reached this location, it seems probable that African violets started to break up into the different subspecies we find today. They are evolving or pulling apart into separate species, but haven’t yet finished the process. The DNA studies also suggest that African violets are a relatively young plant group, having their origins as recently as the Pleistocene ice age of 10,000 years ago. This information is consistent with other members of genus Streptocarpus which appear to have colonized Africa from Madagascar and moved north over time. The same migration pattern is seen in the species of African violets moving from the Uluguru Mountains northward. 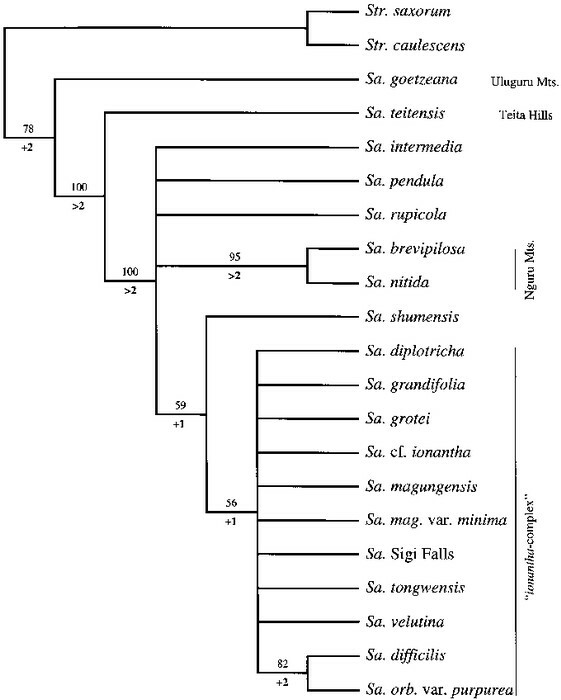 Diagram from Moeller and Cronk (1998) illustrating an early genetic analysis of Sainpaulia species and their degree of relatedness. 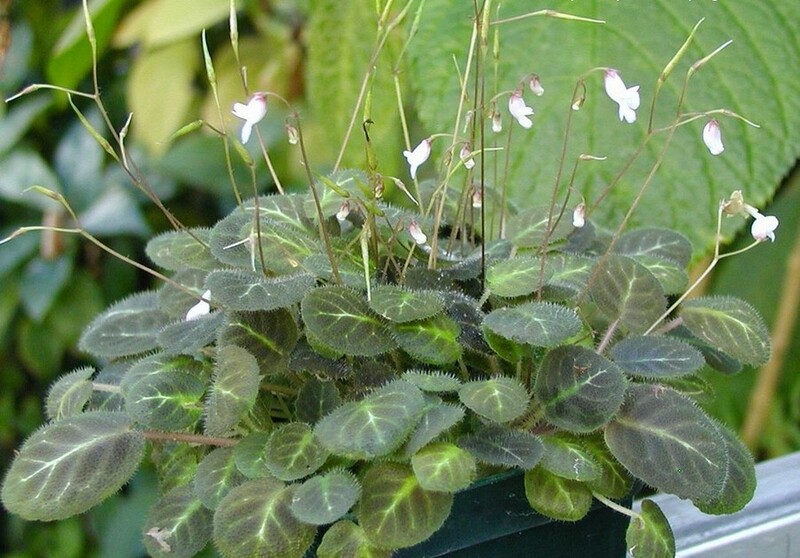 S. goetzeana is shown as likely ancestral to other species, and the most closely related to the Streptocarpella group of Streptocarpus. The large number of closely-related variants within the “ionantha complex” from the Usambara Mountains suggests rapid evolutionary change. This analysis was borne out by genetic studies over the next 15 years. The names used here are as used at time of publication.